Sydney is a board-certified nurse practitioner specializing in medical and surgical dermatology. She received her master of science in nursing from the University of Cincinnati and her bachelor of science in nursing from Ohio University. 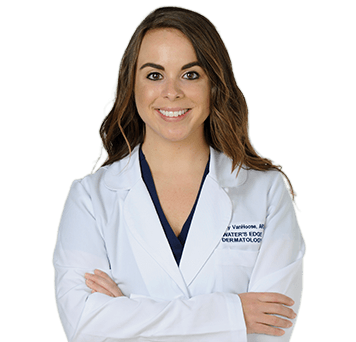 Sydney loves the diversity that dermatology has to offer – providing care for patients of all ages and addressing a wide variety of general, surgical, and cosmetic dermatologic needs. She takes great pride in delivering excellent patient-centered skin care. In her spare time, Sydney enjoys traveling, volunteering with animal rescues, and spending time with her husband and three dogs.